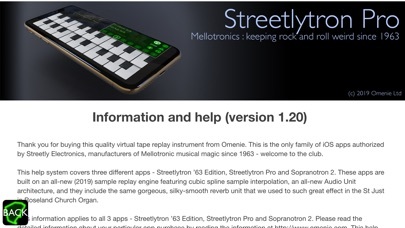 Mellotronics Streetlytron Pro : the most authentic Mellotronics experience for your iPhone and iPad. 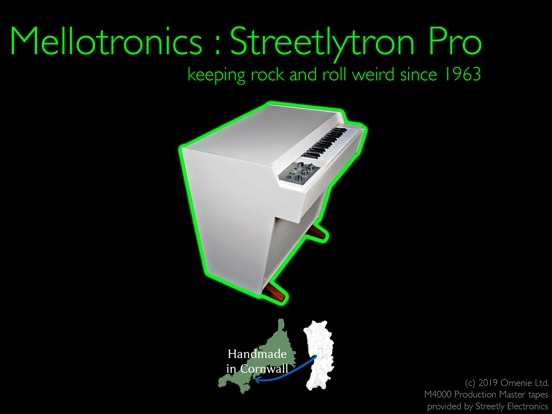 Brought to you in partnership with Streetly Electronics, the inventors of the mellotron, Streetlytron includes a massive collection of 90 tapes, with 65 drawn from Streetly's Production Masters - exactly the same tapes that ship with their $8,000 M4000 unit. Completing the sample sets are our own very popular 'Caitlin Downie Soprano' and 'Clare Lindley Violin' collection, to offer a huge, rich selection of choral and string textures for your mixes. 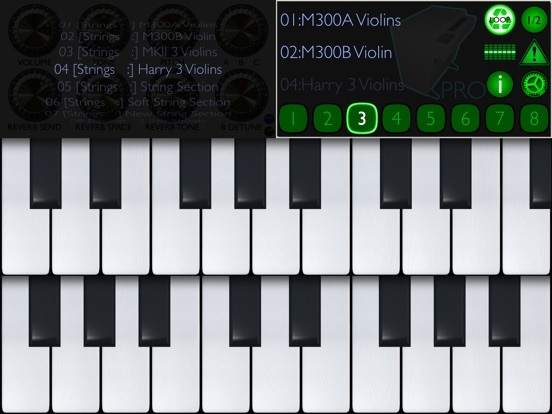 Playable with the on-screen 3 octave keyboard or by an attached MIDI controller, Streetlytron Pro exposes every internal control to MIDI, allowing performance and recording without ever needing to touch your device. A gorgeous, silky-smooth, ultra-musical reverb unit generates immense spaces, and 8 programmable preset slots set you up for one-touch performance. Totally playable and totally inspiring, for everything from classic psychedelic, vintage progressive, modern chamber pop or avant-garde dance sounds. 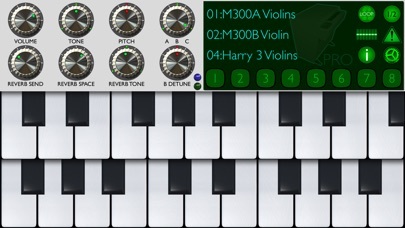 Virtual MIDI, AudioBus and Inter-App Audio are supported. No In-App Purchases, no hidden extra costs. Pay once, never pay again. All voices are available in original form, straight from Streetly Electronics Production Tape library - unlooped 8 second samples, with a unique sample for every key of the 35 note range. 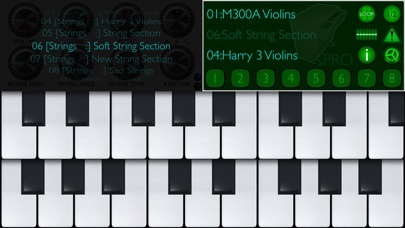 To offer more performance flexibility the 'LOOP' button may be engaged, which process the samples to offer seamless looping. Some voices have decay tails - e.g pianos, harpsichord, staccato voices - and these are left unlooped. 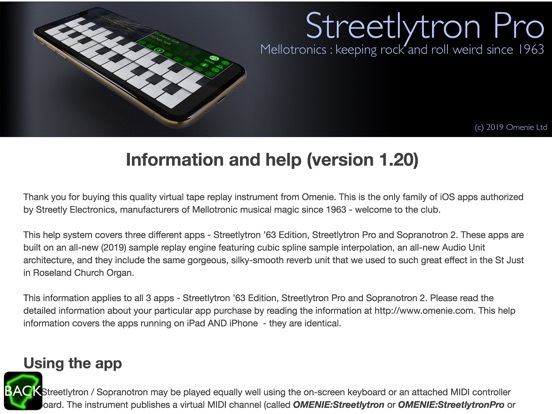 Streetlytron Pro Edition uses an advanced cubic spline interpolator, to delivery premium sonic quality when pitch bending or retuning. One minor update. Two settings have been added to give you absolute control over 48kHz / 44.1kHz operation. If you have a new 48kHz device and the pitch of the audio is consistently off you can override our algorithm and force an internal synthesis rate of 48kHz. Do this in Settings by setting both 'Force Synthesis Rate' to ON and setting 'Synthesize 48kHz' to ON. Synthesis can be similarly forced to 44.1kHz by by setting 'Force Synthesis Rate' to ON and setting 'Synthesize 48kHz' to OFF. If Force Synthesis Rate is off our internal algorthm will run to try to determine what frequency is best for your hardware and environment. I would think you'd be grandfathered into the new app. Perhaps you could contact the developer and see if they did some kind of a bundle price (as a workaround). If not, that would qualify as a $#!++`/ move. If you do contact the developer, don't assume he's trying to rip you off. He may have a plan for helping out the M3000 buyers. @synfiniti: & @stub: Hmm! I just sent an email requesting a comment on this. Thanks for pointing it out. M3000 Explorer Edition appears in the store renamed from the one I paid to have (with all the IAPs) but not the ultimate. Maybe updating? The M3000 class apps are very old now, some of the source code in there is over 10 years old, and the UI was implemented in OpenGL ES, which has been deprecated on iOS for a while. So it was clear to me that soon - no idea how soon, but soon - they would get beyond repair and just stop working forever. So the new Streetlytrons were introduced as ground-up rewrites to replace the M3000s, and the M3000s taken off sale. What I didn’t realize was that by taking them off sale existing customers would no longer be able to download them if they lost their device or upgraded, which is unfortunate, but that’s where we are. The M3000 Free Edition is still up there to give people who want something free to play with, but that will also go off sale during 2019. 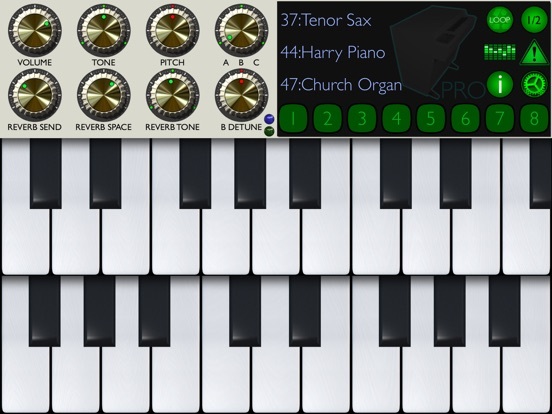 The upside is that the replacements - Streetlytron ‘63 and Pro, and Sopranotron 2 - are way better in every respect, are a brand-new codebase so will keep running for years, and are MUCH cheaper than the old apps. 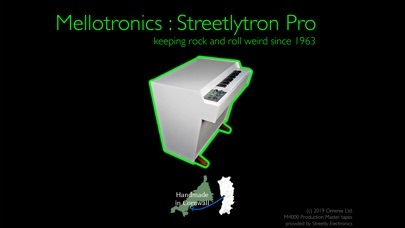 So at the point your old M3000 finally stops working it will cost you very little to replace it with either a ‘63 or a Pro from the Streetlytron range.